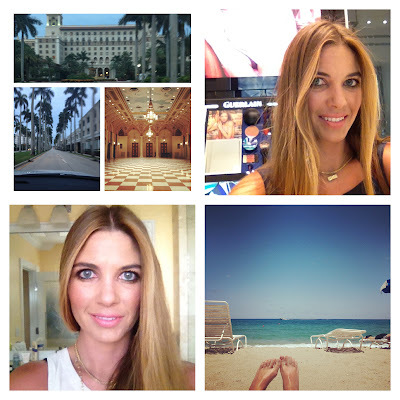 Beauty Professor: Officially Back from Palm Beach! Officially Back from Palm Beach! Clockwise from top left: The Breakers, one of many opulent Breakers ballrooms & the famed Worth Avenue, post-swatching at the Guerlain boutique, the Breakers private beach, and evening makeup for dinner at the Brazilian Court's Cafe Boulud. I just returned from a little trip to Palm Beach with my husband, and, although I didn't engage in any blogging while at the hotel (I forced myself to leave my trusty laptop at home), I couldn't help but plan some future blog posts! The Breakers has a lovely Guerlain boutique which lent itself to some serious foundation swatching. I also spent some quality time at Neiman Marcus on Worth Avenue and, in addition to picking up some new favorite products, swatched every shade of the Le Metier de Beaute Classic Flawless Foundation. Plus...two Le Metier de Beaute products not yet on the market...a new eye makeup remover and cleanser. Despite all of this makeup immersion, I did find a wealth of time to enjoy the pools, pristine beach and Italian Renaissance architecture of the Breakers and feel more rested than I have in a long time. Now that my 2011-2012 school year is over, let the summertime blogging commence! Looking forward to read your Guerlain and Le Metier posts. Thanks, FabKath~photo uploads begin today! Thanks so much, Chelsea! I am really enjoying your blog as well : ) Love your outfit of the days! Sisley L 15 Baby Doll Rose Lip Color...Worth It?